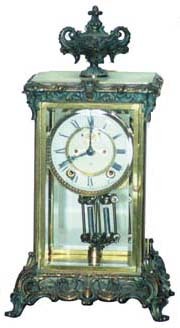 Ansonia crystal regulator "Crown", ca 1914. Case made of polished brass with rich gold ornaments and base, standing 15 1/2 inches high. Case is tarnished and has never been cleaned. 8-day movement, hour and half hour gong strike, serviced and running strong. There is a 2-piece porcelain dial and visible escapement, basically very nice, just one tiny spider web. Beveled glasses all around, the usual tiny corner chips, 2 places. Ly-Ansonia No.357.